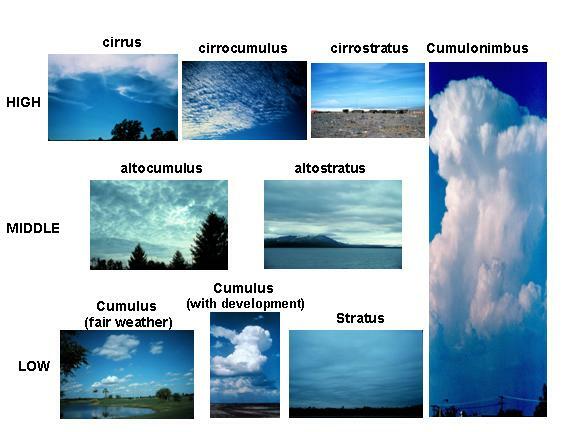 Cloud types are usually classified grouped into "low", "middle", and "high" clouds, refering to the altitudes they occur at. "Low" clouds are generally below about 6,500 ft. "Middle" clouds range from about 6,500 ft to 20,000 ft, and high clouds range between 20,000 and 40,000+ feet in altitude. As seen in the photos above of the most common types of clouds, low clouds include cumulus, stratus, and stratocumulus; middle clouds include altocumulus and altostratus; and high clouds include cirrus, cirrocumulus, and cirrostratus. If low stratus clouds are raining, they are usually called nimbostratus. Cumulonimbus clouds (thunderstorms) often span all three cloud heights, with bases from 1,000 to 5,000 feet and tops sometimes reaching 60,000 feet. NO TWO CLOUDS ARE EXACTLY ALIKE It's amazing that we can catagorize cloud types at all, there are so many shapes and sizes of them. More beautiful cloud pictures, taken by a man who has devoted much of his life to photographing clouds, can be seen here.